We LOVE Cheez-it Crackers in our house! We eat the Cheddar flavor (original), White Cheddar, and my husband loves the Pepper Jack flavor. 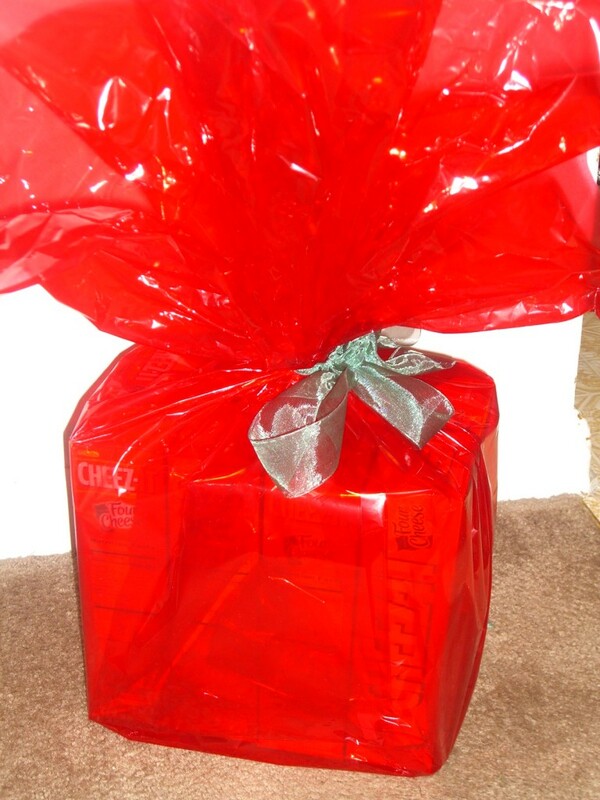 Thanks to Sunshine, we received a gift basket with 3 boxes of the new Italian Four Cheese Cheez-It Crackers and a Dean Martin CD. We were excited to try yet another new flavor – Italian Four Cheese Cheez-It Crackers! I really like this flavor a lot and the rest of my family loved it just as much because we’ve already gone through 2 boxes (out of 3). The four cheeses include Parmesan, Romano, Asiago, and Mozzarella and together they make a fantastic taste! Along with the Cheez-It Crackers, we received a Dean Martin CD with many of his classic hits. 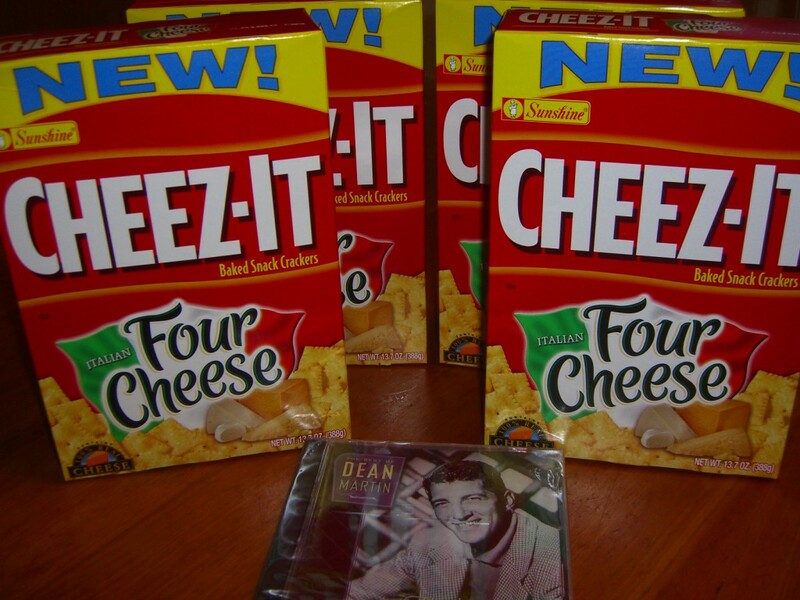 We love Dean Martin and it was a great combination with the Italian Four Cheese Cheez-It Crackers! 1 winner will receive a “That’s Amore” Gift Basket, including 4 boxes of the Italian Four Cheese Cheez-It Crackers and a Dean Martin CD of his best hits (including “That’Amore”)!!! – Tell me in a comment what your favorite flavor Cheez-It Cracker is! Entrants may not participate with multiple e-mail addresses. Any entrant who attempts to enter with multiple e-mail addresses, under multiple identities or uses any other device will be disqualified from participation in the promotion and all entries submitted by that entrant will be void. District of Columbia who are 18 years of age or older at time of entry. Employees of Sponsor, its affiliates, subsidiaries, advertising and promotion agencies and their immediate family members and/or those living in the same household of each are not eligible to participate. 1. WINNER SELECTION: Giveaway winners will be selected at random on 2/15/2010 from among all eligible entries received during the Giveaway. Winners will be determined by the Sponsor. Winners will be notified by email. In the event the Sponsor is unable to contact the winner within 24 hours of first notification, prize will be forfeited and an alternate winner selected. 2. PRIZES/APPROXIMATE RETAIL VALUES: Number (1) Giveaway Prize: 4 boxes Cheez-It Italian Four Cheese Crackers ARV: $4.19 each, 1 Dean Martin CD: $19.99 each. Total ARV of all Giveaway prizes: $36.95. Odds of winning Giveaway prize depend on total number of eligible entries received during the Giveaway. Unclaimed prizes will not be awarded. 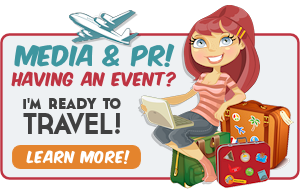 Limit one (1) prize per person for each promotion. 3. GENERAL: Subject to all federal, state and local laws/regulations. Neither Sponsor, nor its affiliates will have any liability whatsoever for any injuries, losses or damages of any kind caused by any prize or resulting from acceptance, possession, use and/or misuse of any prize or participation in these promotions. By participating in this promotion, entrants agree to be bound by the Official Rules and the decisions of the Sponsor, which are final and binding in all respects. Sponsor not responsible for any typographical or other error in the printing of the offer or in administration of the promotion. 4. Sponsor is not responsible for electronic transmission errors resulting in omission, interruption, deletion, defect, delay in operations or transmission or alterations of entry materials, or for technical, network, telephone equipment, electronic, computer, hardware or software malfunctions or limitations of any kind, or inaccurate transmissions of or failure to receive entry information by Sponsor on account of technical problems or traffic congestion on the Internet or at any website or any combination thereof. If for any reason the promotions are not capable of running as planned for any reason Sponsor reserves the right in its sole discretion, to cancel, terminate, modify or suspend the Sweepstakes and select the winners by random drawing from among all eligible entries received from all methods combined up to the point of the action taken by the Sponsor. This promotion has not been sponsored by, endorsed by, nor is affiliated with the Kellogg Company. Cheddar. But I like the reduced fat cheddar. Thanks for the giveaway. White Cheddar is my fav, but they’re ALL good! the original cheddar cheese flavor- in fact I ate some last night! I like the Pepper Jack flavored Cheez-it’s. I’m like your husband, I love the Pepper Jack ones! Our favorite flavor is Cheddar (the original one). Thanks! I like the cheddar but that may be because it is the only flavor that I have tried to date. Thank you for hosting this giveaway. I love the regular cheddar flavor the most! I love the Four Cheese. Thanks so much. We love the Original flavor, and have a box of the Pepper Jack flavor ready to try; I think our favorite would have to be the Italian Four Cheese variety! I can’t wait to try it! I like the Cheddar Jack crackers. I think the 4 Cheese would be good too. Thanks. I like the Original. I think the others would be good too. I prefer regular (cheddar) cheez-its, but haven’t tried that many of the new flavors other than white cheddar I think. i can eat a whole box of white cheddar. yum! Hot and Spicy was better than I thought. My fav is the white cheddar! LOVE Cheez-its! I have only had the regular ones. I’d love to try another flavor! I like the original flavor the most, but I also like Pepper Jack. My favorite is original, everyone else in my house likes White Cheddar. My favorite flavor is the Original Cheddar. My favorite flavor is the original Cheddar flavor. Thank you for the fun give-away. My favorite is Parmesan & Garlic. My favorite is the Pepper Jack flavor. Our favorite around here is the Cheddar Jack..YUM! Four Cheese is more cheese and my favorite! Four Cheese is more cheese! My favorite is the Cheez-It Duoz Smoked Cheddar & Monterey Jack! I can’t believe how good they are! My mother in law is a big fan of the regular cheddar. A good book , a box of Cheez its and she’s in bliss! Bring on the Hot and Spicy…YUM! All Cheez-Its are delicious but at our house we like the original flavor best. Thanks for the contest. I like the duoz with the garlic parmesan. They give you some terrible breath but are soooo good. lol Thank you!! I love the white cheddar ones!!! Yummy!!!! I like White Cheddar. thanks! I adore the original cheddar. The white cheddar is good too but my fav so far…is the cheddar. I like the plain old original ones! I LOVE HOT N SPICY, as shown in this picture. I need these cheez its! I LOVE the White Cheddar Cheez Its! I could devour the whole box, along with an ice cold Pepsi! ONe of my favorite snacks! Cheddar is my favorite, never tried the others. I’m a traditional Cheez It Girl! I like the orginal Cheez-it! White Cheddar is my favorite variety! I pick the Pepper Jack ones, yummo! I guess you would have to say that i like the cheddar ones the best. I have tried the white cheddar and they are not too bad either. I have to say the original cheddar, I’ve never tried any of the other kinds. But they sound good. I really enjoy the multigrain flavor. My favorite is White Cheddar! I love the new 4 cheese variety. it is addictive. My favorite is White Cheddar, but I have a feeling I would love these too! The general consensus here is the original cheddar, but I recently bought the white cheddar so maybe that will be the new favorite. We’ll have to wait and see until we get to that box!! My Goodness! I haven’t thought about Cheez-it in ages. But I always loved them and don’t know WHY I stopped buying them. I will start all over again this week! I do like the original flavor, but these 4 cheese ones sound so good I may just buy them instead! Parmesan garlic is my fave. We like the original Cheddar Cheese Cheez-its. In our home, White Cheddar reigns supreme, but Original is my favorite. My favorite flavor is white cheddar! Well, I haven’t tried it, but based on what I like – I’m betting it’s the Hot & Spicy! The original Cheddar is my favorite. I love the White Cheddar flavor! My favorite is the Original flavor. I love their White Cheddar flavor. I like original cheez its the best. I love white cheddar Cheeze-Itz! Umm like the original and white cheddar not sure one is more favored than another- just depends what i am in the mood for. I love the white cheddar. my favorite flavor is pepper jack. We like to mix the White Cheddar and the Hot & Spicy together. My favorite cheez-it flavor is white cheddar! I like them all but my kids really like the parmesan/garlic ones. All the flavors are delicious but at our house we like White Cheddar best. i love the hot & spicy cheez-its! My favorite is original cheddar. My favorite is the Italian 4-Cheese Cheez It crackers. I didn’t know that they had released them for sale yet. I was in a focus group last year where we were sent a box to taste test, and we ate the whole box in 2 days! They are amazingly delish! I like white cheddar. I find it a more intense flavor than the others I’ve tried. The Original Cheez-It Crackers are my favorite. My very favorite is the Four Cheese & then I love the White Cheddar! I love the reduced fat cheez-its! They taste just like the original but are more crispy…So delicious!